Saturday May 12th is National Train Day. Train stations all across the United States will be celebrating with events and contests. But what exactly are they celebrating? And why? National Train Day is a celebration of the Golden Spike. 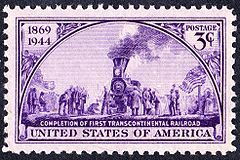 This year is the 143rd anniversary of the completion of the transcontinental railroad, with the Golden Spike signifying the final spike that was hammered into the final rail tie to complete the project that is perhaps the greatest historical event in North America’s transportation history. 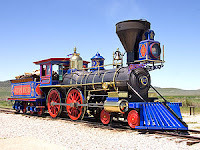 On May 10th, 1869, in Promontory, Utah, the tracks for the Union Pacific and Central Pacific Railroads were joined together, completing a dream that had been envisioned since the late 1830s. Despite nearly twenty years of discussion, dreaming, debating, it wasn’t until 1853 that Congress put forth money for surveyors to work on this great project. Two years later, fearful Congress might drop the ball, California joined in the efforts. In 1862, President Abraham Lincoln signed the Pacific Railway Act authorizing the Central Pacific and the Union Pacific to build a railroad to the Pacific Ocean. A ground-breaking ceremony took place at the beginning of the following year in Sacramento, California, and ten months later the first rail was laid in Sacramento. Work continued from there, and even long after the two railroads were joined, creating railroads all across the nation, connecting what once were insurmountable mountains and difficult-to-cross land and rivers. "When we stood for the first time on the iron-bound shores of the Pacific a generation ago and looked upon their desolate mountains, after a voyage of more than half a year, we thought in our hearts that the last tie that bound us to our native land was broken. We did not dream that the tie that was to reunite us, and make this our native land forever, was then flourishing as a green bay tree in our woods." The tie he referred to was the final tie in the railroad, a crosstie cut from a California laurel tree. The golden spike hammered into it was the brainchild of David Hewes, brother-in-law to California Governor Leland Stanford. Hewes had the spike cast and finished as his contribution to the great railroad project. Since this was to be the very first major media event in the country, Hewes also planned to spread the news with the firing of heavy cannons. As Governor Stanford drove the golden spike into the laurel tie with a silver mallet, telegraph lines would be triggered and cannons fired in cities all across the country, including San Francisco, New York and Chicago. In all but San Francisco, plans for cannon-fire were quickly replaced with plans to trigger fire alarms instead. Two engines, Central Pacific No. 1 also known as The Jupiter, and Union Pacific No. 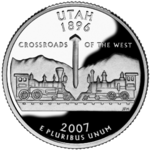 119 would each travel to Promontory, Utah via their respective railroads. They would meet nose-to-nose, with the cowcatchers on the front of their engines touching. The ceremony was not without glitches. Heavy rains, riots among laborers, rumors the vice-president of the Union Pacific was being held hostage, and bridge wash-outs were all issues that had to be dealt with over the span of just a few days. Finally, on the morning of May 10, 1869, the Central Pacific train arrived with Governor Stanford. Not long afterward, the Union Pacific train arrived. Union Pacific workers laid the final section of rail on the north side of the gap between the two lines, and Chinese workers dressed in freshly laundered garb laid the final section for the Central Pacific. The Transcontinental Railroad was nearly complete. In anticipation, telegraph connections were established and fire alarms were ready to be set off across the country as soon as the final spike was driven. Reporters and spectators were present on that sunny day in May. Representatives from the UP and CP hoisted the laurel crosstie and slid it into place. After a speech and a prayer, followed by more speeches, Governor Stanford was presented a silver maul that was wired to the telegraph. When Stanford hammered the golden spike, news quickly spread as cannon fire let loose in San Francisco and fire alarms were triggered all across the country. The two trains moved forward to touch noses. Champagne flowed and the celebration began all over the United States. Later, the golden spike and laurel tie were removed and replaced so they could be preserved. The golden spike and silver maul were eventually donated to Stanford University, and the laurel tie was placed in the Southern Pacific’s San Francisco office and destroyed in the fire that followed the 1906 earthquake. There is obviously a lot more to this story than can possibly be included here, and Governor Stanford’s contribution to the entire project was great. These events will be celebrated on Saturday, May 12, 2012 in the fifth annual National Train Day begun by Amtrak in 2008. In New York, Chicago, Philadelphia and Los Angeles, participants will be able to tour private luxury rail cars, freight trains, and commuter trains. Other, smaller events will be held across the country. To see if there are any events in your area, you can click here, and then click your location on the map. Train travel is one of my favorite pastimes, and this summer I’ll be traveling on the Coast Starlight to the RWA conference with Anita Mae Draper. Do you enjoy train travel? What are some of the places you’ve visited by train? Great post Suzie. And I feel like I have to thank Keith as well! I do love trains. My grandpa worked for New York Central and my mom was full of stories and memories of riding the train to visit relatives and visiting her dad at work in the roundhouse. He worked in extreme heat shoveling coal into the fireboxes. This Saturday two of my grandchildren are going to a small train station to see Thomas (the tank engine) They are obsessed with that whole island of Sodor's inhabitants but I will never recognize who is who. Ive taken Amtrak and enjoyed it. Love to be able to read and look out the window. I also enjoy the MBTA commuter system of Boston because I use it as a tourist. Cant wait to hear Inky train stories coming up in July. Deb, did you ever ride the Acela? That's the high speed Amtrak train in Boston, NY, DC, and I believe Philadelphia. Since my east coast experience is limited, I've not been on one yet. I would like to take the train from Boston to Florida. That's one of my train goals. The other two are Via Rail across Canada, and the Orient Express. I have a fascination with trains, too, thanks to family history. My great-great and great-grandfather were trainmen on the Colorado Midland out of Colorado Springs in the late 1800s. And my grandpa "rode the rails" during the Depression for a time when he was just 12-13. My dad says that's why granddad loved pancakes. Another hobo gave him a nickel to buy a stack of flapjacks when my grandpa was about starved to death. Cool history, Niki. Colorado was an important railroad system. I'm glad the hobo shared with your grandpa. Pancakes are enriching to our life experience, I think. ;-) So would riding the rails, I think. I tried to talk Keith into it once and he acted like I was a nut. Well, maybe I am, but I thought it would be fun to take the opportunity and see where it would take us. Fun post, Suzie. I've got railroad in my blood, too. My dad is a rail historian. I used to ride Amtrak / the Coast Starlight in college and loved it. I'm envious about the trip you and Anita are taking! Wow, what a story about your grandpa, Niki! Deb, I never memorized all the Sodor people, er, trains. James is easy because he's red. Just pretend you're Sir Topumhat and and tell everyone they're "useful little engines." Deb, Susie, I feel really dumb b/c I don't know about Soders and an island. Deb, they do Thomas the Tank engine in Snoqualmie / North Bend sometimes. Keith and I saw it last summer when we went up there. Very cool for kids. Susie, my comment to you disappeared. I think your dad and my husband would get along great. Though Keith doesn't write books like your dad does. But he does take tons of pictures. I wouldn't be surprised if they've run across each other before. Have you ever been to the Sacramento train museum? Keith has lots of great pictures from there. He says it's a "must-see". DeAnna, I've heard europe by rail is really lovely. I can't wait to see for myself someday. I haven't been to Colorado or Utah on the train. Those are two places I'd like to go. I did ride through the section from Sacramento that goes all the way to Utah, but I got off in Nevada. Going through Donner's Pass was beautiful. Suzie - no, only the Empire Builder route. this train goes from Chicago to Boston. Stops in Albany to pick up/ drop off the cars that take the hudson Valley to NYC. I don't know what happened to my other comment. Sodor is the Island where Thomas and his friends live. Wonderful stories and characters. One might be found saying "Well, bust my boilers, that's good news!" Thanks for clearing that up for me, Deb. I thought there was some part of history I should know about. Mt son was older when Thomas came about. I would love to go from Chicago to Niagra Falls on the train. The trip from Chicago to DC is beautiful. Suzie, my dad and Keith have to get together sometime! The railroad museum in Sacramento is amazing. I've been a handful of times. I confess my favorite part is the china exhibit, with all of the rr lines' dishes. Big shocker! Glad the confusion over the island of Sodor cleared up. :) Thomas the Tank Engine was started by an English vicar, and my guess is he valued "usefulness" over other traits, b/c that's the biggest praise Thomas ever gets. He's a useful little engine.